This is a report from a trip end of July 2016. 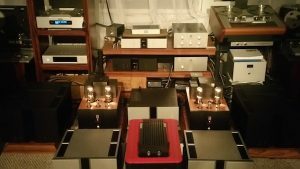 At Bob’s, I heard the Magico S1 mkII, S7 and he also had the S3 and S5II in the room, and has M3s with him. The S1II, S5II, S7 ALL have the diamond coated BE tweeter that was designed for the MPro. Each model has a “tuned” version to match the specific speaks’ midrange drivers. The midrange drivers are multi-wall carbon and Nanographane and again all of these latest models have very similar MPro technology, but different versions to match the tweeters and woofers in the respective speakers….same for the woofers. All designed for the MPro and passed on with derivative versions for the latest S models. X’overs same thing….all MPro derivatives….even the Q7II is a derivative of MPro technology. First we started with the s1 MkII. Now, as a a background, I have before heard the older S3 with Mark Levinsons, Elberoth’s S5 with his MSB amps, Sonrock’s Q5s with Karan 2000, and heard the Q3 with Constellation at shows. This year I heard the newer S5 in Munich and thought it was much better than the older ones. Bob started playing his S1 mkIIs with his tape deck. The soundstage was massive, and you couldn’t make out where the sound was coming from, the speakers disappeared that well. There was the older S7 standing right behind it, and one could be fooled for thinking it was coming from them. We soon switched to the S7. I had expected the S7 to blow away the S1, but this was not to be. The S7 had more weight, and bass, but the new magico technology of the S1 mkII is really good. If you have been a fan of Magicos, you will likely upgrade. If you haven’t been a fan before (Myles certainly wasn’t), you should listen to the newer ones, one of which Myles ended up with. On the S7s, while the weight was greater, they reacted more with the room and disappeared less. This is also what you will find with panels – try putting a large Apogee or Analysis into a room where they face imaging issues due to the room size – the smaller models in that case will work better except will have a bit lower bass and weight. 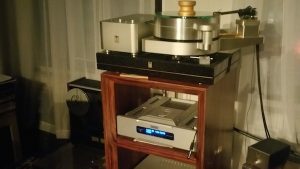 Bob has set up his system so that one can start listening to the Kondo m1000 mk2 pre going into the Vitus class A SM102 100w amps. I really like Vitus. Everytime I have heard it, including at Jazzhead’s with his Marten’s and at Munich each year, they have had a nice flowing liquid class A full bodied sound. A bit tubey. Slower than Gryphon or Boulder or Spectral, but denser and more liquid. We could easily swap over to listen to the Vitus pre SL 102 going into the Vitus amps – some differences, the Vitus was balanced while the Kondo was RCA. On vocals I found the Kondo was actually faster and more involving while the Vitus was a bit more laid back. But when we switched over to orchestral I though the Vitus pre held it better together, which was more I think a function of the synergy and balanced connection, rather than to do with difference in the pre itself, but this is a good example of auditioning to compare synergy. Bob prefers the Kondo, I preferred the Vitus. We then switched over to the Kondo pre through Kondo Kaguras, which are only 50w Dual Parallel SETs. These had great control over the Magicos – I thought they would struggle, but didn’t. The Kondo was extremely involving, as good valves are, but given the price differences, I walked away extremely impressed by Vitus. Incidentally, this is the same Kondo pre that Detlof owns. This runs on an SS recti, and the one Audiocrack owns is the Mark 1, which is a tube recti. 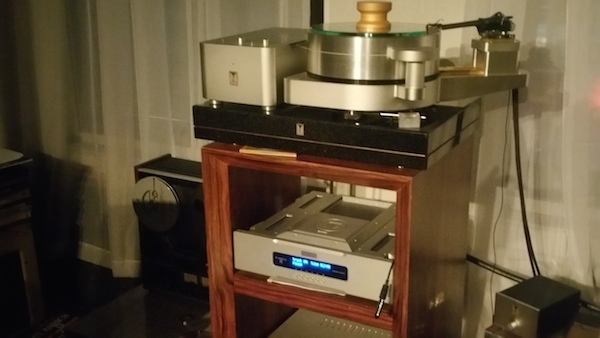 The digital was played through Pi Greco Sinfonia transport (Italian) going into the Vitus dac RD100. We played the analog through Kondo Gringa Turntable and the Kondo IO M cartridge, using the built in phono in the Kondo pre. 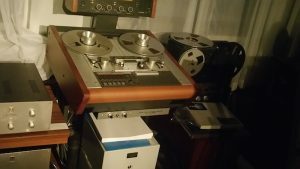 The analog had a beautiful sound and great timbre, but what I preferred were the 3 tape decks that Bob was able to play. The timbre on piano, sax, brass, the soundstage and the layering is so much more enhanced by tape deck. Seriously folks, the S7 costs 58k USD…the S1 MkII 16k. Buy the S1, get a tape deck and 100 tapes, you will still have money left over for the electronics and you might just reach the cost of the S7. And you will have a better sound. For those with room constraints for larger speakers, the biggest upgrade you can get is a tape deck. Bob has arranged his equipment so that it is easy to swap over. We then moved from the S7 to Ubiq – mid model. They are beautiful looking speakers, at only 14k retail. At Bob’s place you can literally do a blind test by letting him swap over from S1 to S7 to Ubiq, and see which you prefer, ignoring the price points. The Ubiqs are really good. Bob also played his active Goldmund (which are slightly bigger than monitors), through his Aurender. 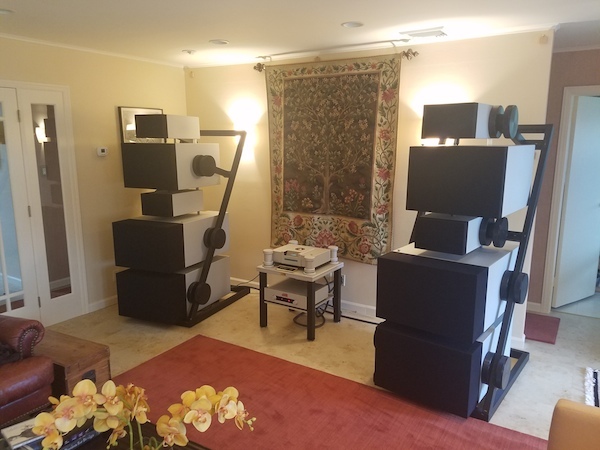 The key thing in Bob’s room is whether you play the Ubiq, any of the Magicos, or the Goldmund, you will always get an excellent soundstage, speakers will disappear, there will be good imaging with the sound layered behind the speakers. Bob has a lot of tweaks and acoustic treatment in his room, and while he has been in the trade for over 15 years, he has always been an audiophile, has owned the older apogees and trios, and his experience is showing. Bob has since been selling a number of uber expensive Goldmund Apologue Anniversarys, costing well over half a mill. 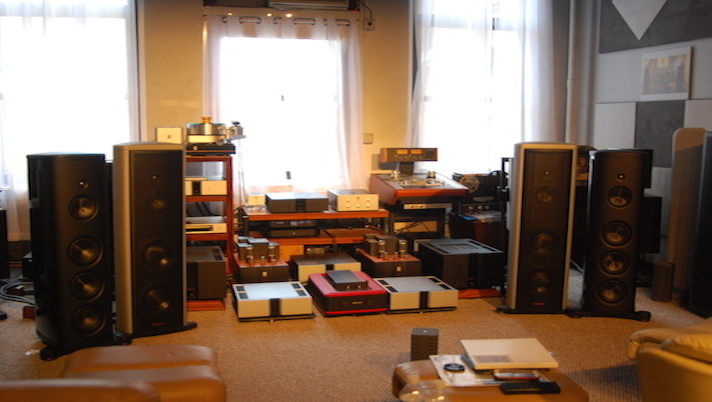 1 Comment on "Magico, Vitus SM 102, Kondo m1000, Kondo Kagura, Rhapsody Audio"
This article concludes with how important it is the get the room acoustics as good and cooperative as possible. A lot of speakers will sound very good to a new person walking into that environment. It provides a good place to hear differences between products. The downside is that even mediocre equipment will perform well. You may have heard better products in other dem rooms, but those rooms were poor acoustically, and so you believe the products are not as good. Does that make sense.